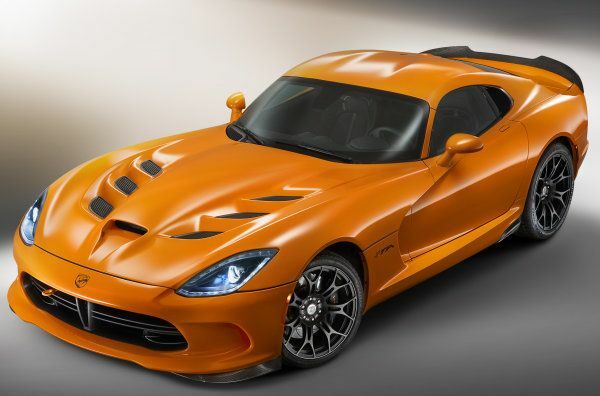 Chrysler announced a few weeks ago that the 2014 SRT Viper would be receiving some new standard features and a new, larger price but the company has now announced that the new model year Viper will also get a few new exterior colors options and a new drive mode to make the Mopar supercar more capable in questionable conditions. First, the 2014 SRT Viper is now available in two new colors inspired by the Viper GTS-R race program – Billet Silver and GTS-R Blue. Billet Silver is the main color of the winning #91 Viper GTS-R race team while GTS-R Blue is the main accent color of the #91 Viper and with the introduction of the new blue, Shadow Blue Pearl has been removed from the option list. Also, as a part of the Anodized Carbon Special Edition package, buyers can select a matte black exterior paint that is surely sheer awesomeness. These three new colors come in addition to the slick orange exterior color shown above that is exclusive to the 2014v Viper Time Attack. Next, the SRT team engineers have developed a new Rain mode for the 2014 SRT Viper that makes the Viper easier to handle in wet conditions or when the road surface is cold. Details are limited on the new Rain mode but considering that it is designed to make the Viper easier to drive when traction is at a premium so this new drive mode likely cuts back on the throttle response while likely also allowing the stability and traction control systems to engage much more quickly. This new Rain mode is standard on the 2014 Viper, Viper GTS and Viper Time Attack and while it is intended to make the 2014 Viper safer in poor driving conditions, Chrysler explains that can also be useful for someone who is new to handling the 640hp and 600lb-ft of torque put out by the Viper’s monstrous V10 engine. For the base Viper, Rain mode joins the basic On and Off settings of the standard stability control system and for the Viper GTS and TA – Rain mode joins On, Sport, Track and full Off mode for the stability system. In addition to the new Rain driving mode and the two new colors, the 2014 SRT Viper base model now comes standard with a 12 speaker Harmon Kardon sound system, HD radio, navigation, UConnect and a back up camera system. However, these new goodies don’t come for free as the 2014 SRT Viper base price is now $102,485 before destination fees or gas guzzler taxes. However, for those who can afford to drop a hundred large on a new American supercar – the Viper has become an even better value without diminishing from the raw performance capabilities of this modern marvel of Mopar high performance. The 2014 SRT Viper is now available for order from those approved SRT Performance dealerships and production of these new model year Vipers should begin soon at the Connor Avenue plant in Detroit. Should FCA Bring A Hellcat Jeep To Market?